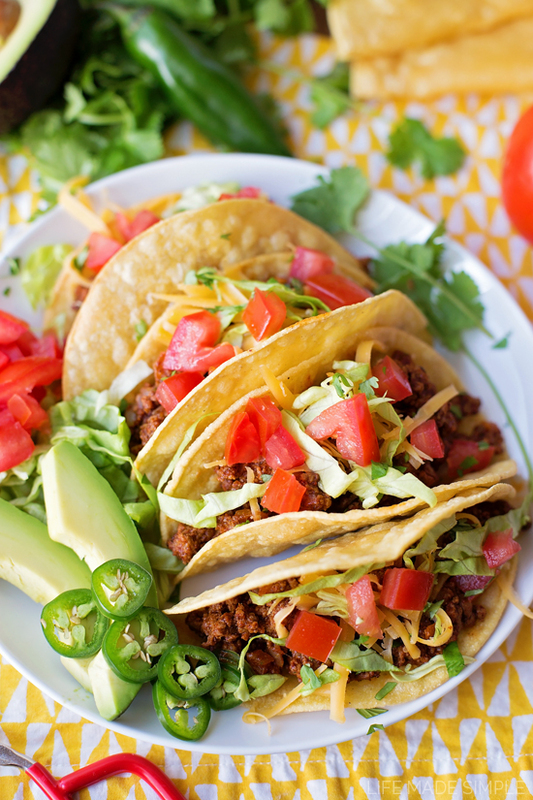 One of my favorite go-to meals (aside from pesto) has to be these beef tacos. 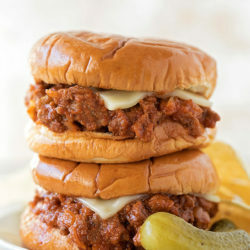 They’re easy, flavorful and ready to go in less than 30 minutes! Sound too good to be true? Think again! I haven’t always made my own taco seasoning, but as I’ve moved more towards scratch baking/cooking I’ve discovered how simple and flavorful it can be. Most of the spices are pantry staples, perhaps with the exception of coriander (a big favorite of mine, especially when used in Mexican dishes). It takes just a few minutes of measuring and that’s it… you’ve got a bowl full of bold, fresh, preservative-free seasonings and spices. 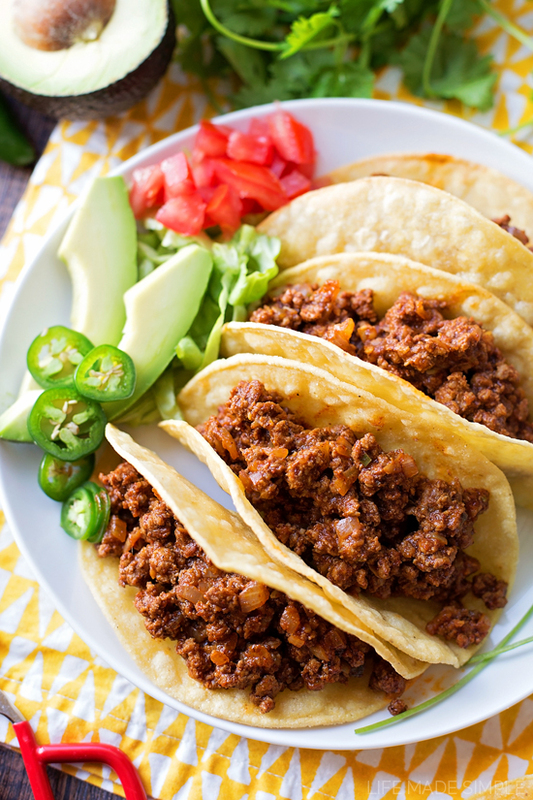 What makes this taco meat so darn good (aside from the homemade seasoning blend) has got to be the use of two secret ingredients: brown sugar and apple cider vinegar. 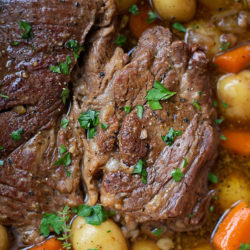 Just a teaspoon of brown sugar along with 2 teaspoons of apple cider vinegar give the meat a sweet and acidic flavor that can’t be beat! I also like to add extra onion, garlic and either a jalapeno or a bit of serrano for even more kick. Another reason why this meat tastes 100x better than anything you could make with a packet is the fact that you toast the spices as the meat cooks. 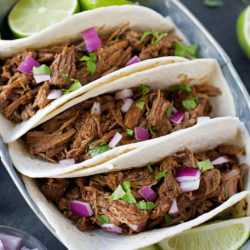 I’ve used this technique before with my citrus carnitas as well as my beef barbacoa. It definitely brings out the true flavor of the spices and adds a smokiness that I love. Once your meat has simmered for about 10 minutes all that’s left to do is stuff some taco shells! Fried corn tortillas are definitely my top pick, but when we’re in a rush I’ll grab soft flour or hardshell corn… no matter what you use, these tacos are gonna be delicious! 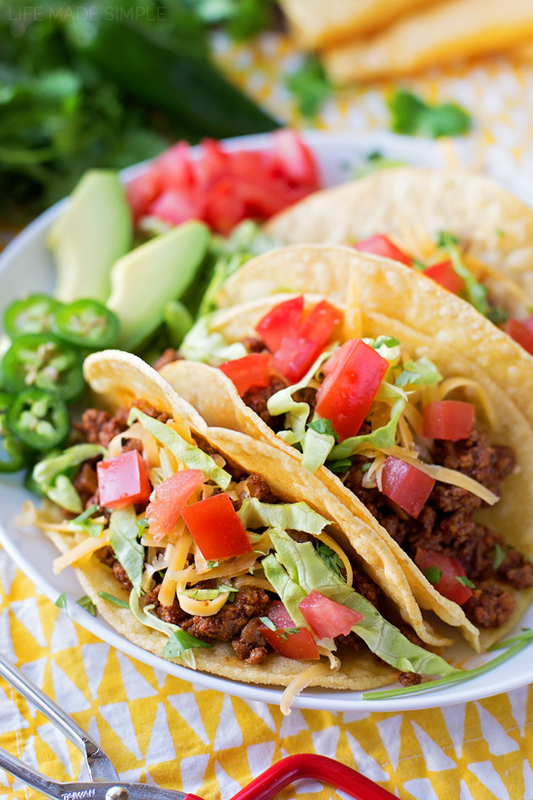 Next time it’s taco night, I sure hope you’ll give this recipe a try- it’s bound to become a family favorite! 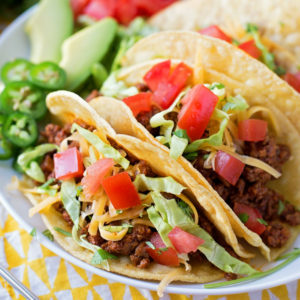 A homemade blend of seasonings and spices along with a few secret ingredients make these the BEST (and our favorite) beef tacos! In a large skillet set over medium heat, add the olive oil. When the oil is hot add the onion, sauté until soft, about 4-5 minutes. Add the pepper, garlic and seasonings. Continue to sauté until fragrant, about 2-3 minutes. 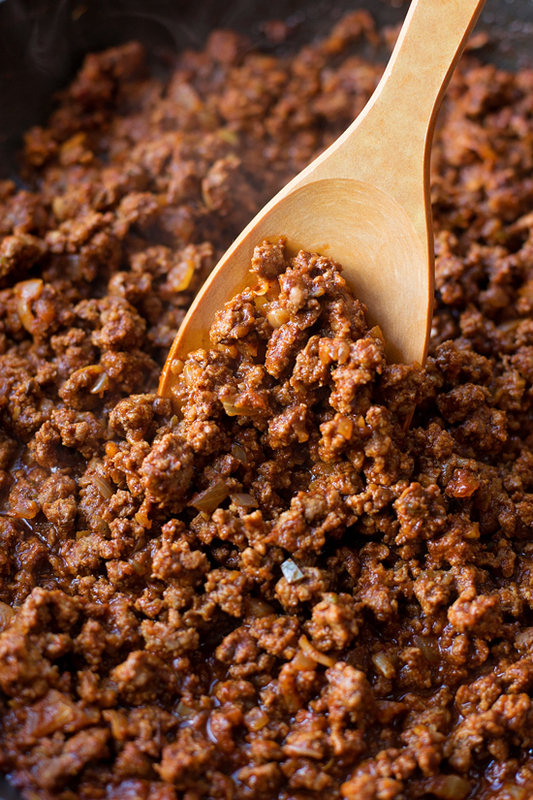 Add the ground beef and cook until no pink remains, breaking it apart into small chunks with a spatula or wooden spoon. When the meat is cooked throughout, pour in the tomato sauce, chicken broth, apple cider vinegar and brown sugar. Simmer until about half of the liquid has evaporated, about 10 minutes. Remove from the heat and serve hot. -Adding peppers is completely optional. If you don't want any heat, try adding half of a New Mexico Chile (Hatch) chile. We like ours to have a little kick, so we usually add minced jalapeño or serrano to it.